By Fantana: It is a sad state of affairs when Kings are hung, drawn and quartered in front of their own people. Kings who have inspired many nations, even ones like Scotland, to feel good about themselves. Unfortunately Britain lost a king in Audley Harrison recently, obviously due to extremely poor refereeing, but beside Audley there has been undue flak headed Tyson Fury’s way. In my eyes as a boxing purist he has done nothing wrong. Coming back after being floored by an American to win via devastating clobbering is pretty impressive. It was a performance that Tyson Fury can take pride in, maybe a bit rough around the edges but nevertheless impressive, a bit like a Land Rover. 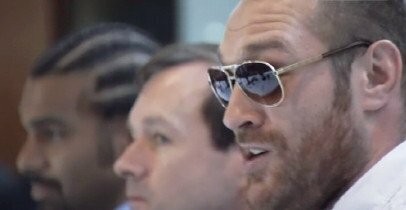 Tyson Fury squashed America’s heavyweight title dream and I believe he is going to do the same thing to Cyprus resident David Haye. In fairness to Steve Cunningham it was a brave performance for sure but it was a losing effort which was underlined by the superiority of a hero of biblical proportions (Genesis – 6:4) in Tyson Fury. It is those proportions along with grit, polish and an excellent singing voice which make Tyson Fury the most exciting heavyweight since Michael Kirkpatrick. Tyson Fury has so many talents he could literally win the X-Factor and Britain’s Got Talent show in the same year and probably challenge for the Dancing on Ice title. It is also a particularly interesting contest for the casual fan who may not know all of the rules of boxing (kicking is mostly not allowed). Most heavyweight bouts these days are unfortunately pretty run of the mill. Two fat old guys trying to avoid a cardiac arrest is not enticing but can prove entertaining in the right circumstances. There is no excitement in these fights which can whip a nation, or even a world, into a frenzy like the old days when Audley Harrison would challenge for a WBF belt. It takes something of extraordinary proportions to motivate the population into buying 10,000 tickets in 3 hours yet Tyson Fury is all the motivation people need. Cyprus resident David Haye has bought us many great knockouts over the years but he is still damaged goods since Toe-gate. He is not the draw in this fight, Tyson Fury is. Needless to say that my opinion may divide many in boxing circles, however we can all agree however that since the beginning of mankind there has been a heavyweight champion of the world. A man bigger, stronger and more willing to hurt others to be called ‘Champ’. Britain has a vast array of champions in all weight divisions but we are especially good at producing big men who punch other big men in the face. None have been as big as Tyson Fury however, who is 6 foot 9. That is bigger than my cousin Mark who is 6 foot 7 and was the biggest guy I knew until this one guy in the petrol station said he was 7 foot 2 – not sure if he as lying though as he was up a ladder at the time. Regardless, Britain produces some massive specimens of men and come September 28th we are going to witness the best of the big men when Tyson Fury beats up Cyprus resident David Haye. This is not to say that all of the ticket sales are purely generated because Tyson Fury brings such menacing action to the ring, in a non-gay way. His opponent, Cyrprus resident David Haye, has bought much controversy in the few years he has been known to the general public. Gone are the days of cheering for him fighting as a cruiserweight against old men, they are now replaced with anger filled bile spewed in his direction as he takes on almost 40 year old legends, such as John Ruiz or Audley Harrison. Britain loves Cyprus resident David Haye for all the wrong reasons. He talks too much, does too little, milks the fact condiment magnate Levi Roots is his dad and basically needs a good slap. It is these stark contrasts which make this fight so appealing out of the ring – that the gullible public of Vicky Pollards will buy into it and think it is a competitive match up, but it really isn’t. David Haye hasn’t fought for over a year and the most action he has done in a gym is flexing his oversized muscles in front of a mirror (nothing wrong with that, mind). At 32 years of age he is a seasoned veteran ready to get wiped out by someone who doesn’t quite run up such a large bill on baby oil. The Queen is no doubt disappointed that David Haye has let his prime years diminish into nothing but cries of toe pain and retirement when he could have been out their generating revenue for the tax man by getting embarrassed by either Klitschko. It really is time for David Haye to be put to the sword and a young man called Tyson Fury is the perfect fellow – especially after the disappointment of the weekend when a Jock won an English tennis tournament. Regardless it is a great match up to be made, the young vs the old, the passing of the torch. This fight will signal in the new era for the heavyweight division and the next stop is destination Klitschko.